Has nesting kicked in? Are your diapers prepped and ready to go? As you wait for your baby to arrive, don't forget to set up your changing area to make diaper changes a breeze! This is a tough one! If your baby is exclusively breast fed, you won't need to spray diapers. So you can keep your changing station in whatever space of your home is most convenient for you. The room the baby sleeps in may be the easiest. If you live in a two story home, it may be helpful to have two areas set up. If your baby is formula fed or on solids, you will need access to the bathroom for poopy diapers. Setting up your changing station near the bathroom may be easiest. If you have a bathroom big enough, putting the changing station in that room may be ideal for you! Should you use a changing table? This is really a personal preference! Some people use their changing tables religiously, while others prefer to change diapers on the floor. If you use a changing table, you can stock the shelves or drawers full of your diaper changing supplies. 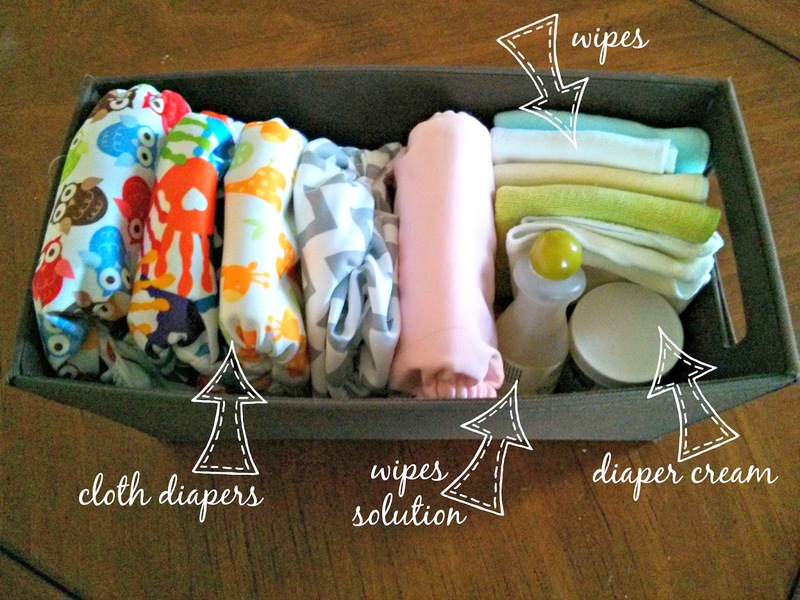 If you will be forgoing the changing table, a basket full of your supplies works perfect! Stock your changing table with a basket full of clean diapers! It helps if they are ready to go (pockets stuffed, soakers snapped into all-in-two diapers, etc). Have your wipes in reach! If you are using dry wipes, keep a spray bottle of wipes solution nearby as well. You'll need your cloth diaper safe diaper rash cream in case your little one has any redness. Lastly, keep your wet bag or diaper pail nearby so you don't have to carry dirty diapers throughout the house. Customize your changing station to meet your needs! Don't forget to check out Pinterest for tons of diaper storage ideas!